The Lineso 15 Pin SATA to 4 SATA Power Splitter Cable Is An Essential Component For Building, Upgrading Or Repairing Computers. 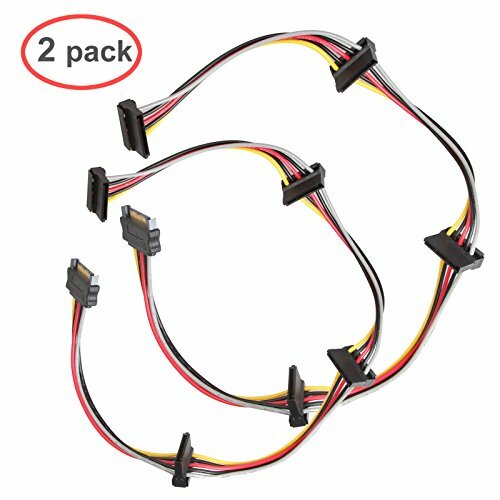 The 19.5 Inch Cable Harness Provides Sufficient Length To Neatly Connect Up To 4 Drives With A Single Cable To Minimize The Impact On Airflow In Your Computer Case. Maximize The Capacity Of Your Existing Power Supply Instead Of Installing An Upgrade With This Durable Cable That Is Built To Withstand 24/7 Use. It Provides An Inexpensive Solution For Adding Additional Drives Stacked In A bay. A lifetime Warranty Is Included With This Cost-effective 2-Pack For Peace Of Mind When Purchasing. Check Your Power Supply Unit Rating To Confirm That It Can Power Additional Drives . - Connector A - 1 x 15 Pin SATA Power Plug . Connector B - 4 x 15 Pin SATA Receptacles . Length: 19.5 Inches / Receptacles Spaced at 4.5" Intervals . Wire Style: UL 1007 Full Copper 18 AWG . Compatible with 2.5", 3.5" SATA I, II, III Hard Drives . Supports 3.3V, 5V, 12V voltages. All LINESO items are Lifetime Warranty,Please contact us email if you have any questions.